Is Shakeology Worth The Money? You Will Be SHOCKED To Find the Truth! Is Shakeology Worth The Money? When I first heard about Shakeology the first thought that popped into my head was, “great, another over-priced protein shake”. I’m a skeptical person in general (I think most of us are), but I also try not to be a cynic. I like to research and do my due diligence on things, and I’m assuming you do too if you’re reading this post and trying to figure out if Shakeology is worth the cost or not. In this post I’m going to explain my experience with Shakeology and my thoughts on it. Like I mentioned above, my first reaction to Shakeology was skepticism. It wasn’t until I heard some of the testimonials coming in that I decided to do some research and seek out information on the ingredients and possibly consider giving it a try. Shakeology got her off the poor digestion rollercoaster. Lifelong chocoholic replaced sugar with Shakeology. Helped her lose over 50 pounds. Doctors were amazed by her health transformation. Shakeology improved her health and her self-esteem. Shakeology solved Hilary’s portion control problem. Mother of 3 lost 12 lbs in her 1st 2 weeks. This is just a small example of the kinds of results I was hearing about Shakeology. 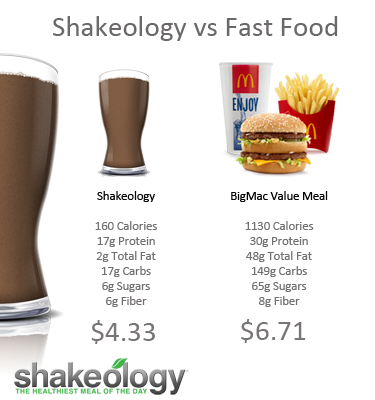 I became intrigued and decided to some research and check out the ingredients in Shakeology. Was not just a “protein shake”. Was loaded with exotic superfoods and powerful phytonutrients. Was a “whole-food” formula which is important for optimal nutrition. Contained no artificial sweeteners, flavors, colors, or preservatives. If you’ve never heard of any of those ingredients above, don’t worry, most people haven’t and I don’t even know much about any of them either (except that they all have amazing health benefits). Feel free to spend a few minutes on google researching, you’ll find some great information. For example, Sacha Inchi is a fairly new discovery in the United States, but has been used as a food source in the Amazon rainforest for over 3,000 years! During my research, I learned that Shakeology is NOT just a protein shake. Shakeology is a SUPERFOOD shake! Even though I was hearing great things from people that were drinking Shakeology, and the formulation and ingredients looked amazing, I was still skeptical but willing to give it a try and see for myself if Shakeology was all hype, or if it really was the “real deal”. So I finally placed my order for chocolate Shakeology. My first sip of Shakeology I was pleasantly surprised at the taste. I expected it to not taste very good, and to have to force it down not for the taste, but for the health benefits is provided. My expectations were wrong. Shakeology tasted great, and was healthy for me too. Win/Win! My answer is YES. Shakeology is worth the cost. As of the time I’m writing this, I’ve been drinking Shakeology almost everyday for nearly 7 years. I love the way it makes me feel. If I miss a day or 2 my body feels “off”. It’s like my body craves the good nutrition Shakeology provides it. What Does Tony Horton think of Shakeology? Want to try creating your own version of Shakeology? The video below gives you an idea of what how much it would cost you. The video with Tony Horton above is a bit of an exaggeration, but it’s not too far off. The video does a great job of showing some of the superfood ingredients contained in Shakeology, and Tony Horton is pretty funny in it. The concept of Shakeology is to replace something that you are already eating everyday (that isn’t very healthy) with Shakeology. You’re not adding Shakeology to your existing diet. you are replacing something. This means that the expenses will offset each other and often times you’ll find that you are actually saving money. For example, I have a friend that stops by a gas station every morning on his way to work. He picks up a coffee, a bagel, a Mountain Dew or Red Bull, and a bag of chips for a snack later in the day. Every day he was spending 6 or 7 dollars on these unhealthy snacks. Usually people will look at the daily expense and are shocked to see what they are spending on a weekly or monthly basis. When I did the math for him and showed him he was spending close to $150 a month on these unhealthy snacks, he was shocked. My suggestion for him was to replace the bagel, Mountain Dew, and bag of chips (coffee was non-negotiable) with Shakeology. He followed my advice and in one one month he lost around 12 pounds from making this one simple change and the cost was about the same. SEE ALSO: Does Shakeology Work Without Exercise? It comes down to priorities and what people want. I have friends (acquaintances might be a better word) that tell me Shakeology is too expensive, yet these same people spend $100 on booze every Friday night at the bar ($400/mth! ), or $3 dollars a day on a coffee, Red Bull, 5 Hour Energy, etc. For these people, it’s not that Shakeology is too expensive, it’s just that it’s not important to them. People have the money for what is important to them. For me personally, my health is important to me, so I chose to spend $4 day on a shake that is providing me with amazing nutrition. So is Shakeology worth the cost? To me it is.